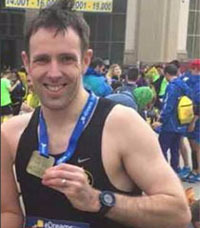 Dermot with his well earned NYC 2018 Marathon medal! 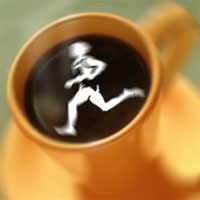 I started running for the first time late 2006 at the age of 39 and still remember that first run. On the way home that day I heard a radio promotion for the Cork Marathon to take place in June 2007, first time to take a marathon back to Cork since 1986. I found an old pair of runners and off I went, no idea where I was going or how far I should run I just kept going, from Ballincollig in the Straight Road, cut across past the Tennis Village out Model Farm Road and back Killumney road to my house. Curious how far I went I hopped into the car to drive the same route – just over 9 miles. Post DCM discussions at Doheny & Nesbitts! 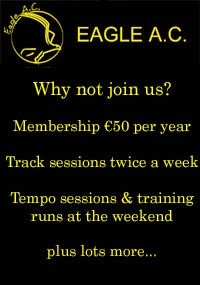 The big event last weekend was of course the Dublin City Marathon. 24 Eagles made it to the start line and a word of commiseration to the other 5 members originally entered who didn’t make it this year. All wrapped up before the start! 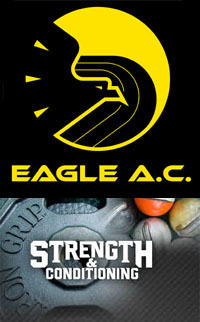 Leading in the Eagle challenge this year was Viv Foley in a brilliant 02:42, followed by club captain Damian smashing through the 3 hr barrier for the first time going all the way to down to 02:50. Four more made it home under the 3 hour mark. Donal Dowling with a massive PB outing of 2:53, Ruairi O’Callaghan 02:55, Tom Fox 02:59 (first sub 3 for Tom) and Padraic Maher with some nice pacing for 02:59:54. 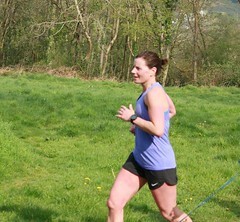 First lady this year was Karen Bevan with a fantastic PB run of 03:26, well done Karen! 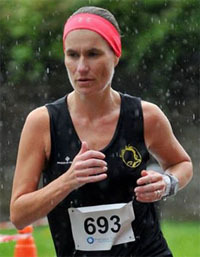 Catherine Murphy (PB), Helen Cronin (PB), Mairead Lonergan (PB) and Dolores Gibbons (PB) the others in our top 5 lady finishers, super running all. 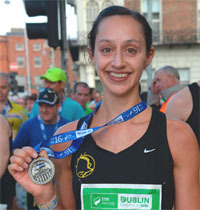 Congratulations also to Catherine McCarthy on completing her first marathon. 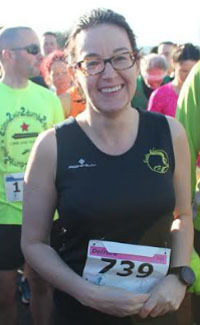 First sub 3.30 marathon for Karen Bevan. Plenty of war stories were exchanged afterwards in Doheny & Nesbitts, along with the usual “Never again” promises which are probably already forgotten. Well done to all, everyone got around safely and some great times with plenty of PBs as well. John Swanton post race with his well earned silverware. Getting to the start line of a marathon is always risky. It’s usually some sort of injury or illness that stops people getting there. But for some of us, it was so much bad luck it was almost like a sign telling us not to go. Mairead Lonergan’s flight was overbooked, leaving her stranded in Amsterdam. There were rumours of sabotage by fellow passengers Ian Roche and Derek Costello but these were later proven to be false. Luckily Mairead was allowed to board literally seconds before they shut the door. For me, my flight was cancelled, and I needed to stay in Paris for one night. By the way, if anyone needs to stay in the Novotel hotel in CDG airport, do not get the shuttle-bus! Turns out it’s a totally different hotel, with the same name, literally miles from the airport. Google Maps is useful for discovering these mistakes after you have made them. Derek Costello also had some bad luck, suffering 2 hamstring tears just a week earlier. After arriving in Berlin he also discovered that when a menu says Jam-Pizza It really is jam, and not ham. Strawberry jam on an authentic thin crust base with cheese, anchovies and olives is risky business the day before a marathon. Ian and Derek eventually arrive in Berlin! Eventually, after making it to Berlin on Saturday, it was straight to the expo for me to get my number. In and out job, no messing about. I didn’t stay there long as I was in search of coffee and chocolate cake. A bunch of us met for a carb loaded pasta lunch and then went to a cafe owned by Karen Bevan’s mother’s cousin. It’s a kind of 70’s retro style cafe, undiscovered by hipsters. The kind of place where you can have an excellent coffee and cake without the bearded men in skinny jeans. I highly recommend the Russian chocolate and pear cake. I read somewhere that Berliners don’t eat bratwurst, It’s just the tourists and marathon runners that eat them. But if Berliners don’t support the bratwurst industry, they sure make up for it in support for their home marathon. The crowds along the course were something else. There is nowhere along the course that is not packed with supporters. 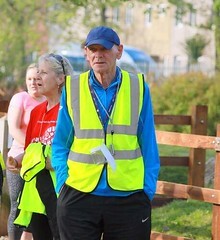 Things that stand out in my memory of the race was an old lady with a clacker about mile 23 shouting ‘new world record’ causing a standing-wave of cheering by all the passing runners. Another memory I have is a group of locals in an apartment balcony over the course with a massive sound system so loud, their neighbour’s ears must still be ringing. 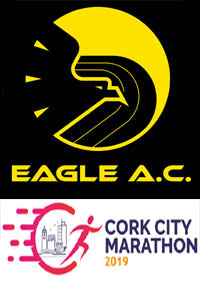 There were some impressive runs by Eagle AC and other Cork runners on the day. 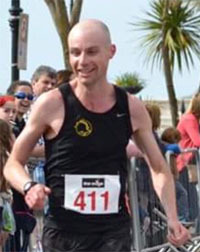 Mark Smith running a PB of 2:32, not far behind Mike Morgan (St Finbarrs) who knocked out a 2:30PB. Vivian Foley ran an incredible time of 2:41 after coming back only recently from injury. 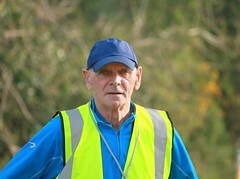 Vivian did get beaten very badly by his rival Donal Coakley (Leevale) though, who ran a PB of 2:38. This rivalry goes back to 12 months ago from when Donal got badly beaten by Vivian. 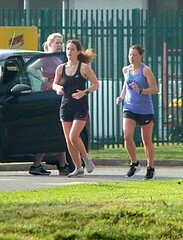 Karen Bevan and Lisa Boland ran a close race, just 12 seconds apart, both finishing in 3:31. Derek Costello, coming into the race with 2 hamstring tears and a stomach full of the jam-pizza, amazingly finishing in 3:57. 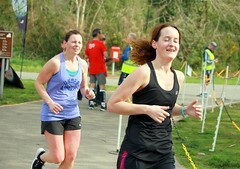 Mairead Lonergan, who I believe also ate the performance enabling jam-pizza ran a great 3:47. Derek, Lisa and Mairead resting their legs at the finish line. Another couple of heroes I have the pleasure to train with, Sean O Keeffe and David Craig (Bandon AC) knocked out solid PBs of 2:42 each. 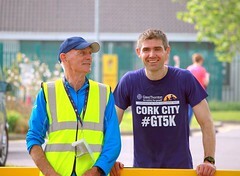 Ian Roche ran a strong time of 3:37, a good way off his PB but will remain fresh for Dublin in a few weeks. A couple of us had not such good races. 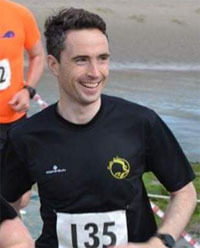 Ronan Boland who was in fantastic shape, unfortunately had to pull out due to a hamstring injury. My own race didn’t go according to plan with me bailing out at 32K with another sore hamstring. I chatted with Alan O’Brien for a bit and he convinced me to get going again and finished what felt like my toughest marathon. Eluid Kipchoge (not Cork) ran a solid 2:01, breaking the world record. It looks like this record may stand for some time so it was a privilege to take part in this historic race. Eliud Kipchoge (Not Cork) on his way to setting a new world record of 2.01.39. After the race we gathered by the Brandenburg Gate near the finish line. Drinking Erdinger and eating bratwurst in the sun like real marathon runners, we swapped stories of the race and swore never-again. Eagles in official marathon jackets. Sales of these from the merchandise shop were directly correlated to sales from the Erdinger truck. Derek trying his best to recruit Eliud to Eagle AC just before the flight home.